Sometimes, your audiologist may tell you that you need an assistive listening device, or an ALD. On occasion, this device will also be used with a hearing aid to help with your hearing loss. Sometimes, your audiologist may tell you that you need an assistive listening device, or an ALD. On occasion, this device will also be used with a hearing aid to help with your hearing loss. Many people are unfamiliar with ALDs, though, so it’s important that you learn more about them before you utilize them. To learn everything you need to know about your ALD, read on. 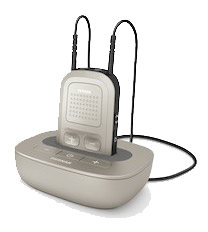 An ALD works almost like a hearing aid; it uses a microphone to transmit sound waves to a receiver, which allows the user to hear sounds clearer and stronger. A hearing aid has the ability to amplify sounds, but sometimes, the sounds can be particularly distorted for those who are especially hard of hearing. An ALD can help with that. It will ensure the sound waves are clear and that sounds are heard without distortion. An ALD also comes with a handheld adjuster, which can adjust volume and signal whenever the wearer chooses to do so. When Would I Need an Assistive Listening Device? While you may wear your hearing aid regularly or even constantly, an ALD is only used when necessary. Hearing aids amplify sounds in a satisfactory way for general use, but an ALD can amplify particularly hard-to-hear sounds. You may use an ALD when watching television or talking on the phone. There are also many uses for an ALD; with or without a hearing aid, they can be used for many things depending on your needs. They can even be used for stethoscope hearing, so those who work in medical fields won’t be slowed by hearing loss issues. They can also be used for alerting someone of a doorbell ringing, which is particularly helpful for the elderly who live alone. Bay Area Audiology can get you an assistive listening device that works for you! Google+, LinkedIn, andPinterest to keep up with Bay Area Audiology. This entry was posted on Friday, November 25th, 2016 at 3:07 pm. Both comments and pings are currently closed.